Earn 0 Creds Per $ Spent at Pottery Barn Kids ? 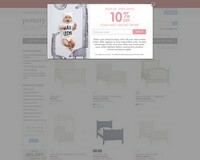 Get this deal now at Pottery Barn Kids Or Join for free to earn eligible Creds! Last hours to shop for your kids bedroom furnitures. Promo sale ends midnight!